Left atrial dissection (LAD) is defined as a false, blood-filled cavity extending from the mitral annulus to the left atrial free wall or interatrial septum, with or without connections to the true left atrium (LA). It is most commonly associated with any cardiac interventions, including both surgical and catheter based, that involve manipulation of the atrium. The clinical presentation and course are very different. In several cases, it may be fatal, by provoking hemodynamic collapse and death. We here present a rare case of spontaneous LAD, which has been studied with three different imaging methods, which led us to the diagnostic and management decision. A 61-year-old woman arrived at our emergency department because of the appearance of intense palpitations for 3 days. She denied cardiovascular risk factors or a previous cardiac disease, did not assume pharmacological therapy, and reported only a recent domestic accidental fall without apparent complications. The heart rhythm appeared tachycardic and irregular, and the remaining vital parameters were normal with a good hemodynamic compensation (systemic blood pressure 135/75 mmHg, SaO2 98%). Electrocardiogram reported atrial fibrillation with high ventricular response (136 bpm). The blood tests were all normal, except for a mild and nonspecific increase in the high-sensitivity troponin T.
The patient underwent a cardiology consult in order to plan the following therapy procedure. Subsequent transthoracic echocardiogram revealed a dilated LA with an interior septum which extended across the longitudinal length of the atrial chamber, by causing the obstruction to the left ventricular (LV) filling, in the absence of additional pathologic findings. By considering that the atrial fibrillation had begun more than 48 h before and the need of investigating the above findings, we have decided to perform a transesophageal echocardiogram (TEE) the following day. The TEE documented the presence of atrial thrombosis in the appendage, a spherical image with clear margins and fibrin branches inside, and a seamless cleavage with the posterolateral wall of the LA, which determined an obstacle to the ventricular filling [Figure 1]. 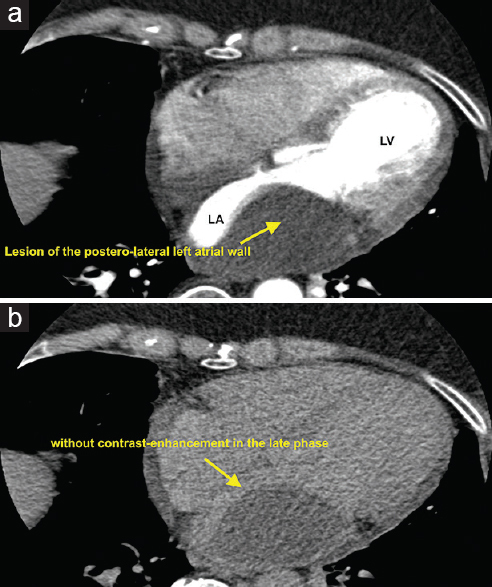 We decided to perform an urgent contrast-enhanced cardiac computed tomography (CT) which confirmed a capsulated lesion within the posterolateral left atrial wall with sharp margins and a basal density of + 30 HU, without any significant contrast enhancement in the arterial and late phases, features resembling those of a chronic hematoma [Figure 2]. After a consultation with our cardiac surgeon, and suspecting an atrial dissection, we planned to perform a cardiac magnetic resonance (CMR). CMR was performed with a 1.5T scanner with cine B-TFE, black-blood turbo spin echo, phase-sensitive inversion recovery, and THRIVE sequences before and after a standard 0.2 mmol/kg gadolinium contrast agent dose. CMR confirmed the intramural formation, within the inferolateral wall of the LA, with diameters of 4.3 cm × 6.2 cm × 4.4 cm, characterized by marked hyperintensity in T2-weighted sequences and high signal in both unsuppressed and fat-suppressed T1-weighted images, as well as the absence of signs of local invasiveness; a thin hypointense rim demarcated the lesion in the steady-state cine sequences. In contrast-enhanced images, a thin rim of peripheral enhancement is appreciated, mostly evident on the posterior side. These findings were deemed compatible with the original hypothesis of an intramural hematoma of the wall of the atrium, probably subacute/chronic [Figure 3]. In consideration of the extension of the intramural hematoma and the LV inflow tract obstruction, the patient underwent a surgery to empty the hematoma and reattach the atrial wall. 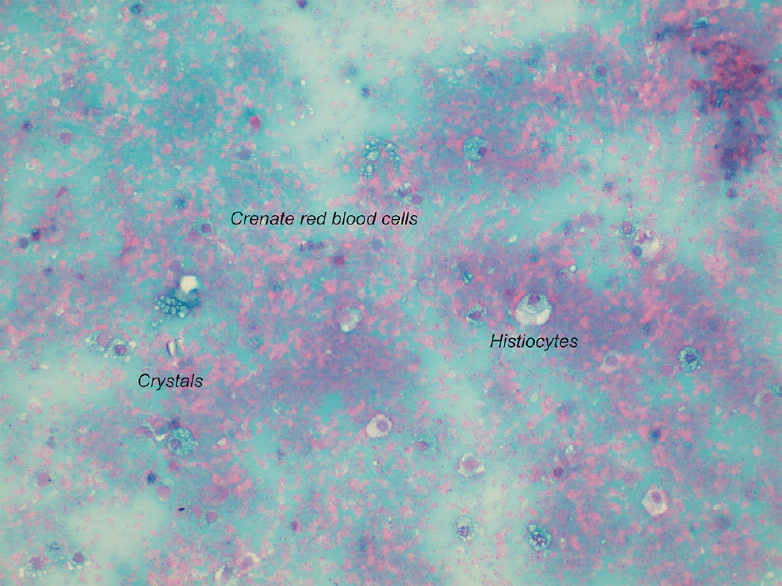 Histological examination confirmed the presence of histiocytes, crenated red blood cells, and crystals, hence a chronic hematoma [Figure 4]. Today, LAD is described as a rare complication of cardiac surgery, presenting an incidence up to 0.84% of patients, particularly after a mitral valve replacement, or anyway after several procedures of atrial catheterization or surgery,, because of a no-intentional injury to the endocardium of the LA. Only anecdotal cases are reported in the literature as spontaneous or posttraumatic. In our case, however, the atrial dissection has had a subacute presentation, which was hemodynamic stable and without any communication with the atrial chambers, but leading to an obstacle of ventricular filling. TEE is a useful tool to diagnose LAD, but it is limited in terms of tissue characterization, and sometimes it cannot tell us the appropriate information about the nature of the observed structure. In contrast to magnetic resonance (MR), it may clarify the nature of intracardiac structures, thanks to its excellent spatial resolution. Considering that there are no definitive diagnostic criteria and the TEE may not be diagnostic, wherever possible, multimodality investigation, using CT or CMR, supports an accurate diagnosis in order to plan for a better treatment approach. In spontaneous cases, the diagnosis of LAD is difficult, even when several imaging techniques are applied, because it is very rare and resembles a cardiac tumor or masses of lobular or cystic appearance. MR was also able to confirm the absence of connections between the large mass on the atrial wall, as well as characterized the lesion as hemorrhagic and therefore, compatible with an involving parietal hematoma. At present, we have two treatment options for LAD: surgical repair and close observation. Surgical intervention involves entry closure and internal drainage, and it is indicated in the presence of hemodynamic instability or significant expansion of intramural hematoma so as to cause the occlusion of the left atrial cavity or pulmonary veins or obstruction of the mitral inflow. In conclusion, LAD is a rare complication, and its pathogenetic mechanism includes valvular heart diseases, cardiac interventions, spontaneous occurrence or tumor. Multimodality imaging approach supports an accurate diagnosis. Treatment options for LAD are close observation and surgical repair, based on the clinical presentation. Fukuhara S, Dimitrova KR, Geller CM, Hoffman DM, Tranbaugh RF. Left atrial dissection: An almost unknown entity. Interact Cardiovasc Thorac Surg 2015;20:96-100. Lee HS, Kim HK, Park EA, Kim KH, Kim YJ, Sohn DW, et al. Left atrial intramural hematoma after removal of atrial myxoma: Cardiac magnetic resonance in the differential diagnosis of intra-cardiac mass. J Cardiovasc Ultrasound 2014;22:205-8. Fukuhara S, Dimitrova KR, Geller CM, Hoffman DM, Ko W, Tranbaugh RF, et al. Left atrial dissection: Etiology and treatment. Ann Thorac Surg 2013;95:1557-62. Tsukui H, Iwasa S, Yamazaki K. Left atrial dissection. Gen Thorac Cardiovasc Surg 2015 Aug; 63(8):434-45. Kurek C, Gwechenberger M, Richter B, Binder T, Loewe C, Gössinger H, et al. Intramural left atrial haematoma mimicking cardiac tamponade after catheter ablation of atrial fibrillation. Europace 2009;11:667-8. Kumar GA, Nandakumar NM, Sudhir BV, Pasarad AK. Role of transesophageal echocardiography: A rare case of acute left atrial free wall dissection. Ann Card Anaesth 2015;18:593-5. Fernández-Golfín C, Jimenez Lopez-Guarch C, López Gude MJ. Left atrial wall dissection after mitral valve surgery: Assessment with cardiac magnetic resonance. Magn Reson Imaging 2011;29:584-5. Lombardo A, Luciani N, Rizzello V, Natale L, Pennestrí F, Ricci R, et al. Images in cardiovascular medicine. 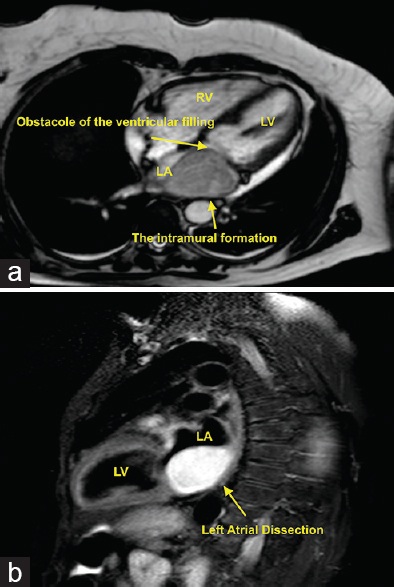 Spontaneous left atrial dissection and hematoma mimicking a cardiac tumor: Findings from echocardiography, cardiac computed tomography, magnetic resonance imaging, and pathology. Circulation 2006;114:e249-50.